Huawei has officially announced its Watch 2 and with it, this expensive Watch 2 Classic smartwatch, and both will be running Android Wear 2.0 . The Watch 2 Classic is the more expensive. At €399, it's 70 euros more than the non-4G Watch 2. The question is - why bother? Essentially, what you get for that is a slightly dressier, stainless steel build rather than the ceramic found on the regular Huawei Watch. We got hands on with both the versions at a pre-MWC briefing and, similar as they are, we thought we'd give you a few first impressions on the differences. We actually found the sporty Watch 2 more comfortable on the wrist than this one, which has a slightly flatter watch back. The 42mm Classic is designed to slip under suit sleeves but at 42mm and 12.6mm thick, it's still quite a large thing on the wrist. It's thicker than the original too - not exactly the direction we want smartwatches to be going in. The 1.2-inch 326ppi AMOLED looks very crisp and vivid as it does on the sportier Watch 2 and there's happily no flat tyre to speak of. This is definitely a watch for men, though Huawei did tell us that a more female-friendly, possibly bejewelled style will follow later in the year as they did with the first-gen watch. The bezel detail looks smart and considerably more watch-like than last year's and there's a dual crown set up, which basically means you get two buttons to press as well as using the touchscreen. You can't twist these, as on LG's new Wear 2.0 options, though, which is a shame as that really suits the new UI. What's nice here is what Huawei has done with the interchangeable straps here. To suit people going to the gym after work and who want to wear the watch all day, you can get leather straps with rubber insides. Looks smart from the outside, soaks up sweat on the inside. Clever. Incidentally, reps also indicated that the first Huawei Watch won't be on sale so this will become the standard, not-so-sporty option if you like Huawei's minimalist choices. 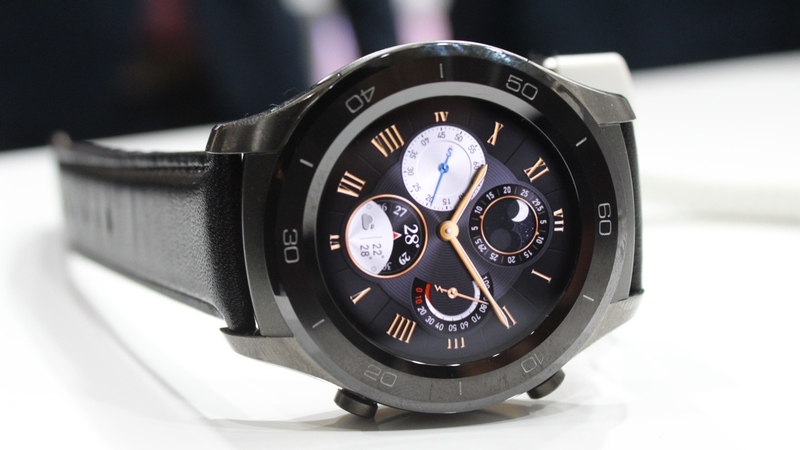 You might think that, like LG, Huawei has launched one feature packed smartwatch and one more stylish but less smart one. Not so. The Classic has all the same features as the regular Watch 2: NFC for Android Pay, GPS, that big 420mAh battery that can last 25 days in a low power, time and steps mode. The only thing it's missing, on account of that stainless steel design, is 4G capability. It runs Android Wear 2.0 and has Wi-Fi onboard but you won't be able to take advantage of the standalone apps on the go as with the main model. We had a very quick play with the Watch 2 Classic ahead of MWC. The Wear 2100 beefs up its power somewhat and everything zipped along and it's worth mentioning that Wear 2.0 is a pleasure to use compared to its predecessor. We didn't have time to test out the fitness features which appear on this watch as well as the sportier model. But we did see the activity watch face, which seems to have borrowed some inspo from Apple's Activity rings, as well as some of the coaching in the Huawei Fit app on the watch and smartphone - warm up and warm down exercises, setting and changing goals, etc. Sure, it's expensive and we wish it was a little smaller but with all this tech packed in, this was only ever going to be a pretty chunky watch. Whether you go for the Watch 2 or this Classic style will depend on if the 4G tempts you and whether you like the look of the stainless steel finish enough to fork out. As we said, we're expecting more styles of the Watch 2 from Huawei so perhaps we will see a range that appeals to women as well as men. With this blend of smarts, sports and style, though, not to mention Wear 2.0, Huawei could have hit upon a winning formula for anyone who just wants everything on their wrist, all the time. Payments, running, alerts, apps. Look out for a full, in-depth review before it goes on sale in March.